Its the age of smartphones, everyone use smartphones to access internet. People are relying more on the smartphones to access internet on the go. I have already mentioned about the need of having a mobile version of your website in the earlier post, Why you should build a mobile version of your website ? 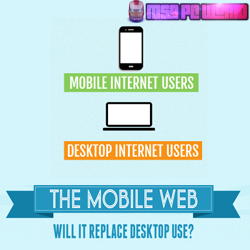 Here is a nice mobile internet infographic showing the comparison between the mobile web and desktop web usage. How much the mobile web usage grown over the years? What type, gender and age group of people dominates in the mobile internet usage? By 2014 mobile internet would take over the internet usage!